I’m back with more from the Holiday Expressions mini catalog from Close to My Heart which is all about the upcoming holiday seasons. It’s filled with items for card making, gift packaging, scrapbooking and jewelry making with clear stamp sets, embellishments and pattern papers. You’ll find spooky items for Halloween, like steampunk spiders, cute kids dressed for trick or treat, labels and tags for treat jars and candy bags. There’s nature inspired wreaths, pumpkins and leaves for fall and Thanksgiving. As well as cute, traditional and whimsical style items like Santas, penguins, nativity, phrases, woodland animals and trees for Christmas and winter. Today I wanted to share some cards I made for Fall and Thanksgiving. For this card I stamped the wreath from the Harvest Wreath first in a medium yellow ink pad and then just around the edges with a brown ink. Then I stamped the berries around the wreath. Next I stamped the adorable deer from the the Miracle of Christmas stamp set, coloring him with markers and cut him out. I cut a small slit in the wreath with an Exacto knife to slide the deer in. 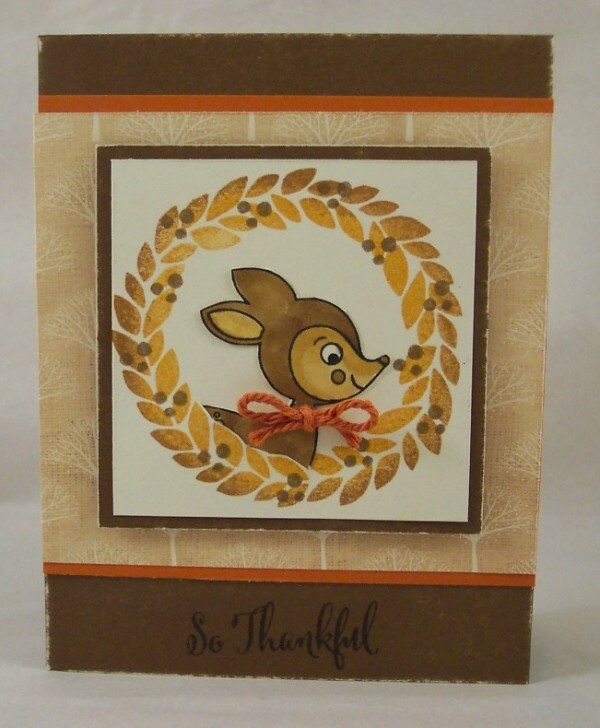 I added a twine bow to the deer’s neck and layered everything onto a card made with cardstock and pattern papers from the My Reflections White Pines paper pack. I love the white core in Close to My Hearts cardstock, it allows you to sand the edges so the white shows through, like I did here. 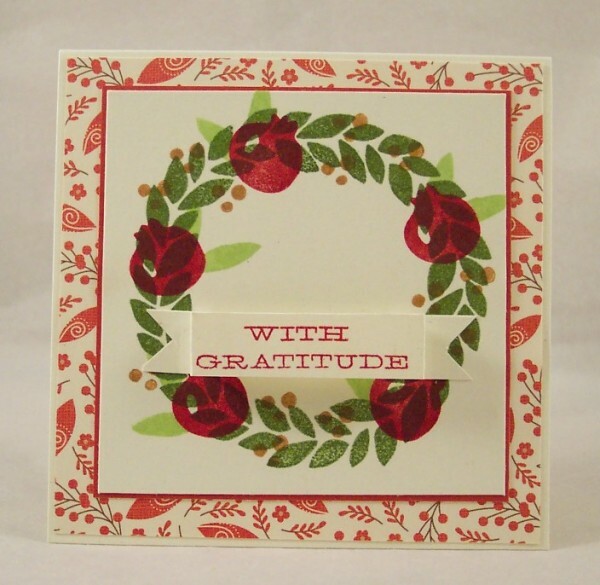 The sentiment I added is also from the Harvest Wreath set. For this next card I made a smaller 4″x4″ card with cardstock and pattern papers from the White Pines paper pack. I stamped the wreath from the Harvest Wreath set in green and added leaves, berries and pomegranates in different colored inks all around. I stamped the sentiment on a small strip of cardstock, cutting the ends into points and folding the edges so the sentiment stands up from the card. This wreath stamp set is so versatile and can be used for every season, just change the ink colors you stamp with. 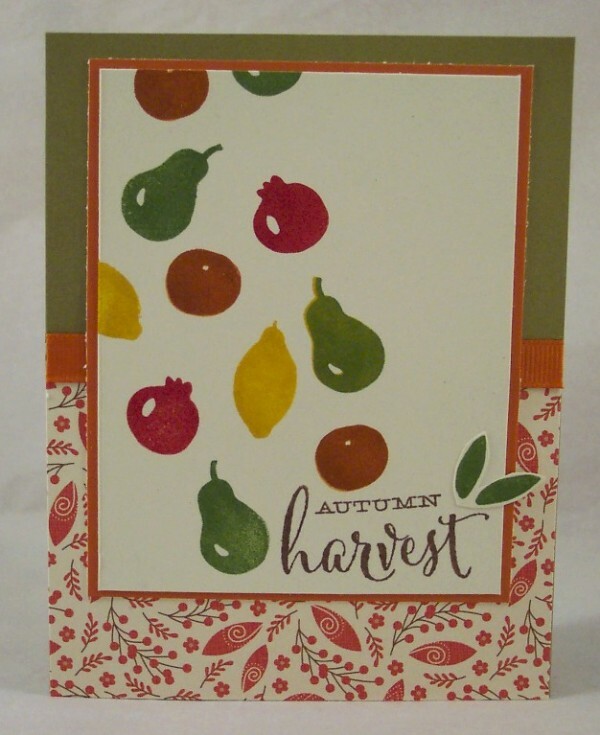 For this last card I made a cascade of falling fruit, stamping each in a different color of ink, stamping the sentiment at the bottom with some added leaves. All stamps are from the Harvest Wreath set, see I told you this was a set with lots of possibilities! The pattern paper is again from the White Pines paper pack. 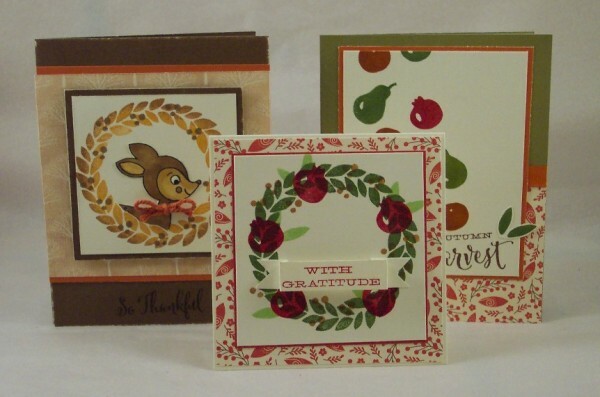 I hope you’re enjoyed another look at the new Holiday Expressions mini catalog from Close to My Heart, click the highlighted link to view the entire catalog. Contact your local consultant to place an order or if you don’t have one visit Close to My Heart and click on “find a consultant”. Check back with me soon for Winter and Christmas ideas using more new Close to My Heart products.